newest member of the AHL's Hartford Wolf Pack. There's a couple children in Fort Myers, Fla., waiting to cash in on a promise to visit Disney World. Don't fret, Lola and Hunter Brown. Daddy Brad Brown is good on his word. It's just that it might take a little longer to come through now that he has made the leap from Florida of the ECHL to Hartford of the AHL. "I didn't think I was going to get called up. I promised them when the season was over, we're going to Disney World," Brown said. "I said; 'I'll see you soon. I have to go to work.' "
In this case, work means finding out how much he has left in his career. The 32-year-old defenseman took another improbable step in a comeback attempt when the battered Wolf Pack called him up from Florida. 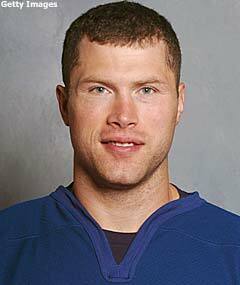 Brown, a veteran of 330 NHL games, had skated in 26 contests for the Everblades and was preparing to settle in there. He was coming off a back injury that cost him half a season with the AHL's Toronto Marlies last year, and that irritated him all summer. He finally felt better around Christmas time, and gave a ring to Gerry Fleming, coach of Florida and an old teammate in Fredericton of the AHL. Fleming said sure, come on over. Hartford, in second place in the Atlantic, offers Brown a prime showcase for whatever skills he has left. The Wolf Pack needs both his bulk (6-foot-3, 218 pounds) and savvy. Taking over as the oldest player on the team, his first challenge is just getting to know his new friends. "Right now, I'm just; 'Hey, how are you, buddy?"' said Brown, a first-round pick by Montreal in 1994. Soon, Brown's wife, Jan-Mari, and their children will join him in Hartford. When the season ends, they will backtrack to Florida for the delayed Disney vacation, then make the 24-hour drive to their home in North Bay, Ontario. It's a lot of traveling, but sometimes that's what it takes for a player to figure out how much he has left. "Right now, I'm enjoying life again. I'm going to finish off here, they have a good team in Hartford," Brown said. "They are expecting to go far in the playoffs. Hopefully, I can be a part of it. As a player, you never want to say, 'What if?' Now, I'm getting that chance." Stafford staying positive -- Grand Rapids defenseman Garrett Stafford had a lot of time to dream about what playing in the NHL might be like. To be specific, 345 AHL games worth of time. That will get a player ready both physically and mentally, so Stafford was primed when he finally made the big time on Feb. 23 for Detroit in Vancouver. "I knew that if I kept working hard I was going to get a chance somewhere. I think I played that game so many times in my head, when I got in there it was like I had been there before," said Stafford, 28. "NHL hockey is really simple, if you break it down. Guys are in the right position. I broke that down in my head again and again." Stafford played in one more game for the Red Wings before coming back to Grand Rapids, where he's immediately gone about the business of earning another audition. He has points in seven of nine games (3-8) since returning from Detroit. "It definitely gave me a lot of confidence. It's one thing to know you can play there, but to do it just gave me a lot of confidence," said Stafford, who has 10 goals and 26 assists for Grand Rapids. "It's carried over to my play down here. It's definitely tough to stay motivated day-in and day-out. But to get a chance to play in the NHL, it's definitely a confidence-builder." Goehring carrying Syracuse -- Karl Goehring began this season as part of the Syracuse Crunch's history. In the past couple of months, history has come alive. So, too, has the Crunch. With points in 17 of its last 18 games, Syracuse has climbed from an also-ran in the North to a solid third-place slot. That's in large part due to the pinch-hit play of Goehring (9-9-2, 2.47, .916), who was signed to a tryout deal in December as an insurance policy. Goehring's clutch tendencies shouldn't have been a surprise to the team. He played for Syracuse from 2001-05, and is the franchise's all-time leaders in wins (72). But this second go-around with the team, albeit in a much smaller sample size, might be his most impressive stretch yet because it comes at a point when he could have been written off. He had short stints with Norfolk and Wilkes-Barre/Scranton this season before joining Syracuse. "I think that experience definitely helps you appreciate everything. Having been through winning seasons and losing seasons, you don't take it for granted," said Goehring, 29. Goehring will never have that problem. Despite all his contributions this season he isn't even on the Crunch's playoff roster. He's on the verge of agreeing to his third tryout deal with Syracuse, one that will keep him around as an emergency backup in the postseason. The pact is Goehring's fifth tryout deal of the year, including one each with Norfolk and Wilkes-Barre/Scranton. "Some years are just like that," he said. "It's just the way it goes. You try to roll with it." Around the AHL -- Milwaukee retired Tony Hrkac's No. 26 into the Bradley Center rafters on March 14. Hrkac led the Admirals in scoring three times and finished his playing days with the Admirals by averaging almost a point per game with 327 points in 340 contests. He ranks fourth in franchise history in assists, sixth in points, and ninth in games played. … Manitoba's Cory Schneider outdueled Daren Machesney in a 3-1 Moose victory March 16, handing the Bears' goalie his first career loss at Giant Center (13-1-3). … Lake Erie's Mike Wall has been busy in the Monsters' cage, facing at least 40 shots in each of his last three outings and eight times in his 25 starts overall. Grand Rapids has peppered Wall with 239 shots in six games this season, with Wall stopping 92.9 percent of them in going 4-2-0 vs. the Griffins. … When Syracuse's Dan LaCosta shut out Rochester on March 14, it gave the Crunch one blanking from five different netminders this year -- LaCosta, Karl Goehring, Adam Munro, Tomas Popperle and Craig Kowalski. … Worcester defenseman Marc Busenburg scored his first AHL goal since the 2004-05 season in a 6-1 win over Lowell on March 14. … Wilkes-Barre/Scranton's Kurtis Mclean picked up his seventh game-winning goal of the season in the Penguins' 2-0 win in Albany on March 15, tying the team record for game-winning goals in a season held by Michel Ouellet (2003-04) and Matt Hussey (2005-06). … Providence's 4-3 win at Manchester on March 14 was the Bruins' 23rd road win of the season, leaving it four shy of the league record with six road games remaining. The Portland Pirates in 2005-06 and the Chicago Wolves and Omaha Ak-Sar-Ben Knights last season won 27 games away from home. … In beating Worcester 4-1 on March 16, Hartford improved its season record against the IceCats to 7-0, and Worcester has not led at any point in any of the games. … Hartford has won at least 40 games for the fifth consecutive season, one shy of the AHL record set by the Cleveland Barons from 1947-53.